Beavercreek’s Kyah Patrick defeats a Lakota East wrestler in a recent match. Patrick is among the Greene County area’s top wrestlers at 126 pounds. 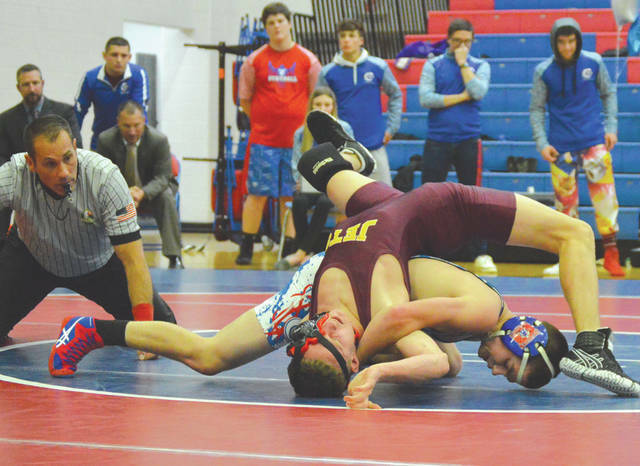 Greeneview’s Teagan Hendricks (shown nearly pinning a Northeastern opponent), and his brother Devan Hendricks (in the background with the crazy warm-up pants) are among the area’s best wrestlers this season. NO REPORT: Carroll, Yellow Springs, Legacy Christian, Cedarville, Greeneview. Compiled by John Bombatch. Send your wrestlers’ top records and pins to: sports@xeniagazette.com.